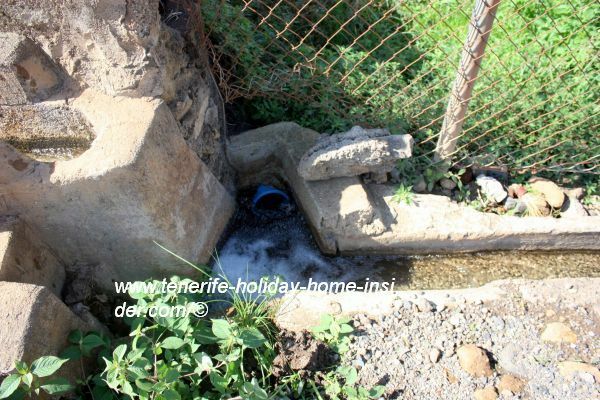 Tenerife transport of water by aqueducts. 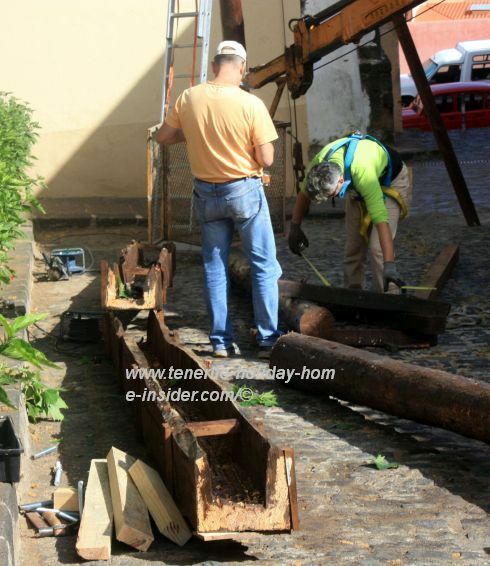 Such Tenerife transport was revived by a wooden aqueduct in la Orotava, in May 2017. In happened during traditional celebrations. The unusual aqueduct was designed by the local carpenter of Carpinteria ARTEMADERA. He created a reproduction of ancient ones. It looked like a work of art. T E A the local, endemic pine was used like in the olden days. Notice how several slender, long boxes that could channel the water between the two building were joined and mounted on stilts. 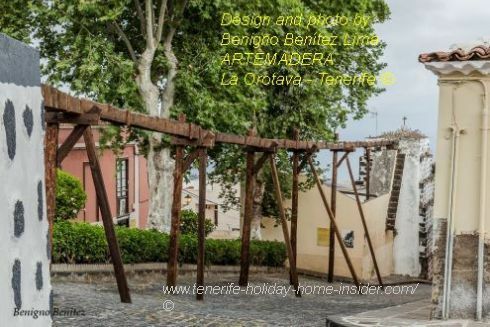 Tenerife transport of water by wooden aqueduct. The timber structure had to bring water from one Gofio mill to another. They were the grain mills of Don Chano and one opposite on Calle Dr. Domingo Gonzalez Garcia, 19-21. Aqueduct section by Benigno Benitez Lima attached to the Mill of Don Chano. The water had to move wheels which generated mechanical power to grind toasted grains. They were made from wheat and legumes like chickpeas. A machine crushed everything into unique Gofio flour. Pine water channel for overhead aqueduct. Also portrayed by more photos is the process when everything was taken down again. 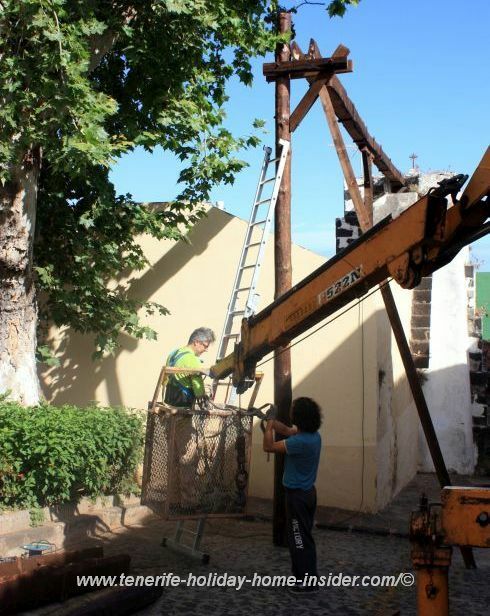 A crane was employed to assist the carpenter. Why remove the wooden aqueduct ? The surrounding conditions wouldn't have met public safety norms for an open air museum. 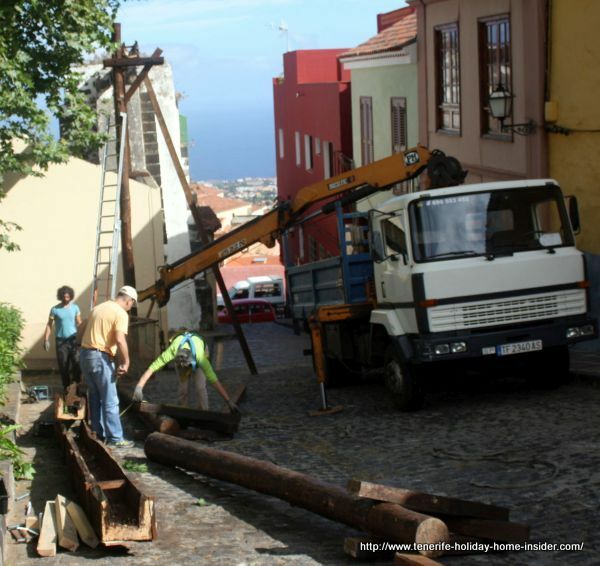 Tenerife transport of Orotava water by other aqueducts. Aqueducts which were mostly made with stone and mortar replaced all wooden ones by the latest in XVIII. 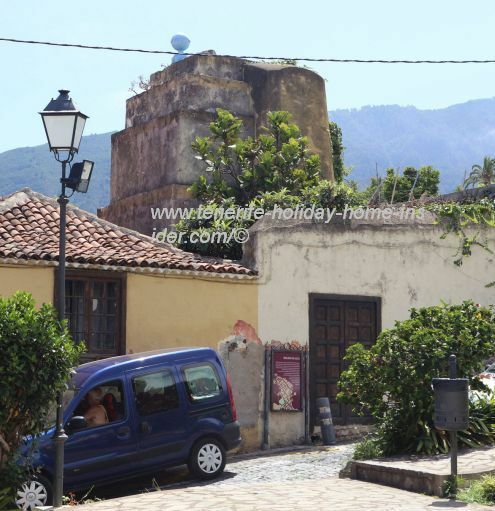 Below admire some remnants that are left in the Orotava old quarters on the Routa del Agua. 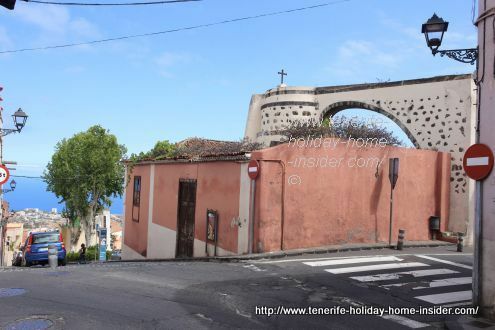 Tenerife aqueduct on Corner C/Dr.Domingo Gonzalez Garcia and C/Buenaventura Machado of La Orotava. 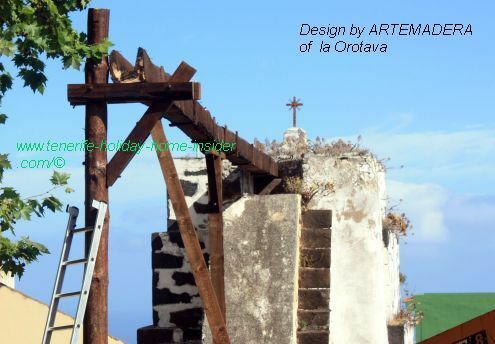 Aqueduct of La Maquina Gofio Mill in C/Colegio 5-7 of La Orotava. Aqueduct remnant by Plaza San Francisco Orotava. Aqueduct Don Chano C/Dr.D. Gonzalez, 14. Depicted is the plaque of the Routa del Agua Water Way or the Gofio mills. In the past, this route represented the main hydrological transport system for its industrial mill operations, drinking water as well as farm water of this region. Water Way Plaque with map of Routa del Agua and Molinos de Gofio outside the Mill C/Dr. Domingo Gonzalez Garcia, 19-21. Otherwise, Tenerife drinking water from natural sources is channeled in underground galleries. 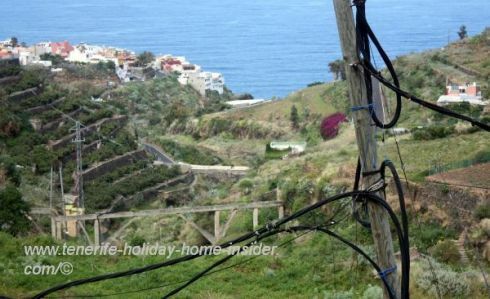 Nowadays, a web of modern plastic pipes brings it to the end-consumer on Tenerife Island. 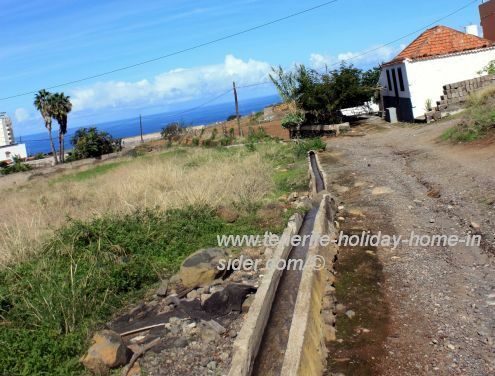 A more rare Tenerife transport system for farm water. Then, you also see the Andalusian aqueducts of "very down to earth" Moorish architecture which was also employed on farms in Portugal. Such ducts conduce water on ground level. Perhaps, you've noticed them on a tourist route of a so called Madre de Agua. 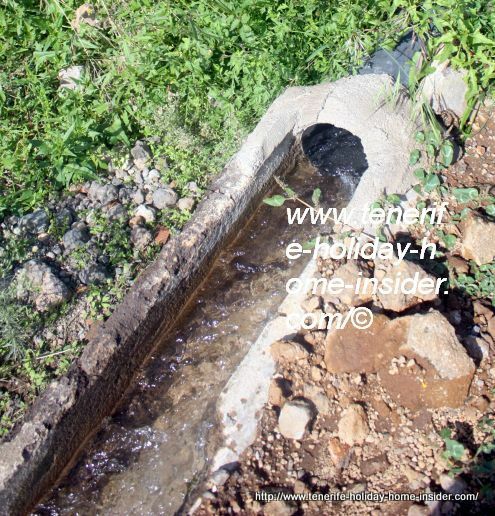 There and on country roads, such open channels supply irrigation water. This simple water distribution system is often made with stones, plus mud, clay or mortar. 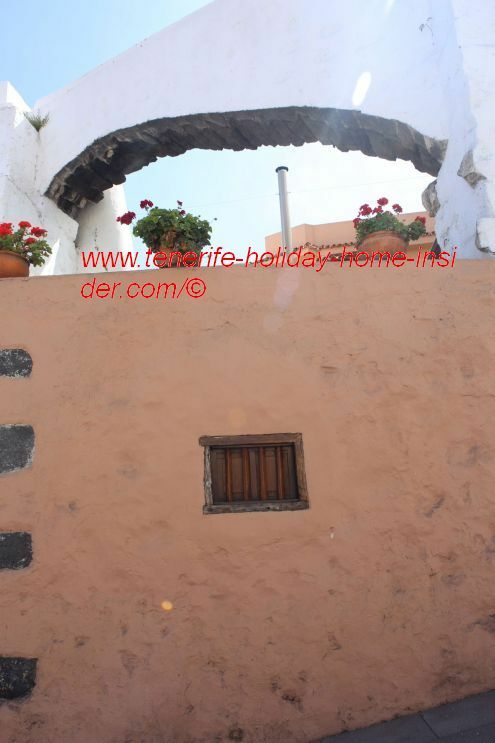 Portrayed below is such a transport system in Calle Piris near La Longuera of Los Realejos. It also feeds water to the Garden Center El Castillo. Andalucian aqueduct on Calle Piris. Some wider ones exist which fed water to Los Lavaderos. There, the village women assembled to do their laundry. 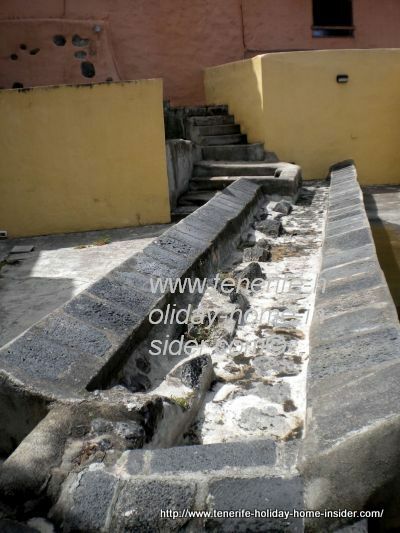 Obviously the laundry basins of the Orotava Lavaderos shared the same network distribution like the area's water wheels. 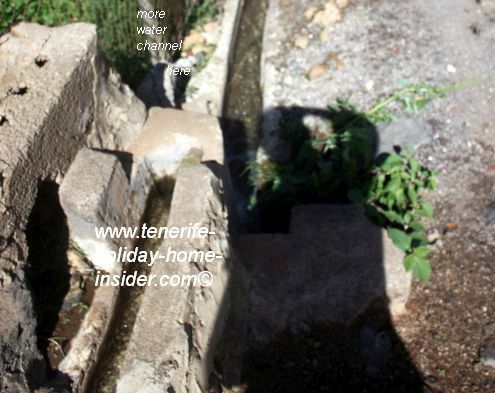 Most historic Tenerife Transport of water by a pine aqueduct. 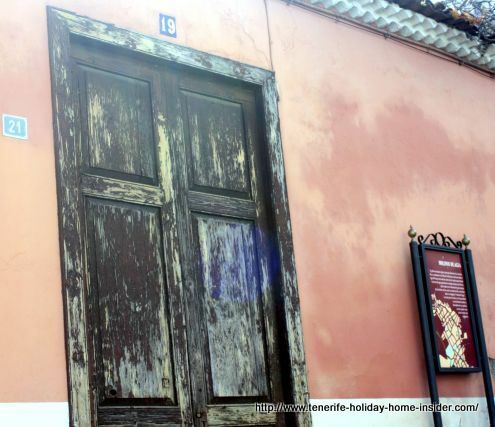 It was constructed on the Hacienda de los Principes shortly after 1496. 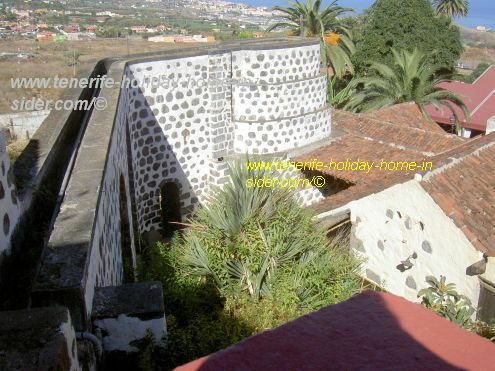 It belonged to the Adelantado the conqueror of Tenerife Island. Remnants of its timber structure still exist on the estate's premises, to the best of my knowledge. Later, water ways that were not made of wood carried the precious, liquid commodity to neighboring suburbs of Los Realejos. It was a transport service that had to be paid for. Portrayed below is such an aqueduct. Aqueduct in the Barranco Godinez Gorge between Realejo Alto and Bajo. A similar one is almost beside the Lidl supermarket opposite Centro Comercial La Villa Alcampo.